At the Optimist International Convention in 2013, a panel of Optimist Clubs described what makes them successful. Optimist International has now released a video that summarizes their findings. Please take three minutes to watch Optimist Club Whiteboard and read through the slides and discover what 8 out 10 Optimist Clubs recommend. 1) Publish a regular newsletter or bulletin. It doesn't have to be much. These days, for certain topics, an email or text will do just fine. The important thing is that everyone is connected to the club, the cause and each other. 2) Don't re-elect the same officers over and over again. It's easy to rely on the same people; however, doing so prevents others from stepping up to leadership and gives the impression that your club is not open to new ideas. Promote others' ideas and potential and they will take you further along the pathway to your Optimist Club's success. What would you add to the white paper for a successful Optimist Club? Please share your thoughts in the comments, send an email or use this form to tell us more. One of the greatest things about the Optimist International Oratorical Contest is that it is open to all students 19 years of age and under. It's not unusual to find a 12- year old competing against a 16-year old and I've even seen contestants - good ones - as young as 7 or 8. Some don't like the vast age range because they don't think it's fair for the younger students to compete against the older, more mature orators. But for me, I think that when the younger students get the opportunity to watch the older ones, they become motivated to do better the next year. That drive helps them get better, do better, and work for the best. An example of younger and older students competing against each other and the younger student being victorious appeared in the Alpena News today from the Optimist Club of Alpena, MI. 17-year old Caitlyn Borke was the first place winner, followed by 13-year old Madelyn Boyd and 12-year old Taylor Ayotte. Also shown in the picture is 13-year old Patrick Martin. He was the only boy to compete this year. I hope he enjoyed the experience and returns next year! See more pictures of Optimist International scholarship program contestants here. Photo courtesy of the Alpena Optimist Club. Being affiliated with Optimist International gives Optimist Clubs the ability to participate in the Optimist International Scholarship programs where there are contests for public speaking and essay writing. There is also a competition unique to Optimist Clubs and that is the Communications Contest for the Deaf and Hard of Hearing (CCDHH). Allowing students who speak in a different manner than most to have the opportunity to share their thoughts, the CCDHH provides a level playing field for participants and awards the winner of each district a $2,500 scholarship. Delanzia Hayes, Jayman Washington, and Pat Brauner. This year the topic is "How My Passions Impact the World." Sadly, fewer Optimist Clubs participate in this program than in the traditional communications programs. Some cite that costs related to translation is a barrier for them while others say that the deaf and hard of hearing population is small and that they would rather focus their attention on causes that reach more children. One thing is for sure, any club that takes on the challenge is rewarded with inspiration from youngsters who are differently challenged every day and yet these remarkable students overcome their impairment and live with joy and achievement. That's what optimism is all about: helping others find their joy. The bonus is you may also find your own along the way. Photo credit: Dean Asher, Fulton Sun. Read about the Fulton Breakfast Optimist Club CCDHH program here. I was looking at the different cover photos that I have used on the Facebook page for the Pacific Northwest District - Optimist International and I thought, my wouldn't they make a great video? 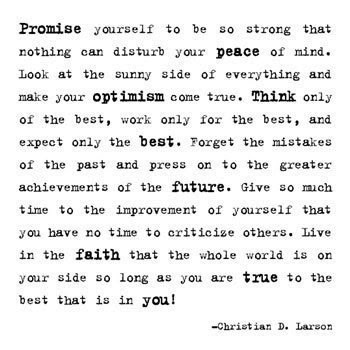 Especially since they are all about what makes an Optimist Club stand head and shoulders above the other service clubs out there - the Optimist Creed. Please enjoy another way to look at one of my favorite inspirations with this short, 30-second video. Yesterday was the last day to submit a video to Optimist International for the #ReelOptimism video contest. Late in the evening, the Middleton Area Optimist Club shared theirs with me. The link came with the message, "While we don't expect our videography to win any awards, we hope that our testimonies win some hearts." The Optimist Club used the prompt I shared with them the week before at the regional meeting for Idaho Optimist Clubs. They gathered the answers provided by others at the meeting and put some of them together in a video format. The club explained that they had a number of entries and that they would share longer ones as posts on the PNW District Optimist Clubs blog. To stay within the 3-minute limit for the contest, they chose only the ones that made instant statements. Find out what "The Greatest Thing About Being an Optimist is" to this fine group of people in this YouTube video. I did not post this year on International Women's Day, March 8, 2014. I had planned to do so as I have for several years now. But on that day I was preoccupied with a regional meeting for the PNW District - Optimist International and since I wasn't engaged in the online stream of my social media accounts, my thoughts for the day went unpublished. And like the plight of many women's issues, my lack of comment also went unnoticed. However, in preparation for the regional meeting of Optimist Club members in Idaho, I created a Women's Day presentation. I tied the awareness goals identified by the International Women's Day organization into a discussion for Optimist Club members. Specifically, I was going to tell them that women must play a visible leadership role in their Optimist Clubs. I was also going to elaborate on the importance of sharing stories online about their Optimist Club. My preparation was for naught. I gave a presentation, but stayed light on the women's day tie-in. Instead I explained that I believe social media is a great equalizer. With social media, there is an extremely low barrier to entry; one needs only to sign up for a free account at Facebook and Twitter, among others. Next, they must share interesting information. A lot more goes into gaining a large number of followers, but I encouraged them to start with the basics first. One must get comfortable sharing your ideas online and then, with diligence, they will get their cause noticed. Participation in social media is a win-win for Optimist Clubs and Optimist International. Happy people, volunteering for worthy causes and sharing personal testimony about the impact that community service has on their lives and their community provides positive social credibility for the organization. I'm convinced that participation in social media will lead to more awareness and more members. And for women - within this post-International Women's Day musing, I encourage women and men alike to share their honest emotions in their stories. By journaling our activities and emotions, we bring our flaws and oversights to light. With the public awareness provided by social media, we may even see where we can adapt, change and do better for all. 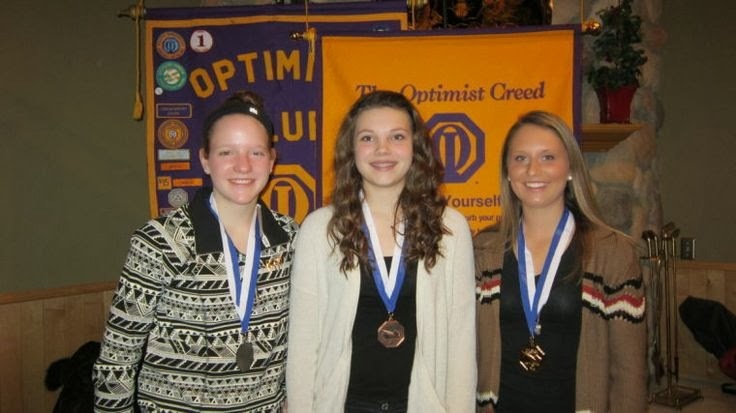 Inspiring positive change: It's what Optimist Clubs do (or should do) best. Donkey basketball? Seen it and done it way back in high school. However, donkey baseball is another story. I had never heard about it or seen it until the Alamogordo Optimist Club put on their most recent fundraiser while fielding grounders astride little burros. Even the Major League Baseball organization called out the club for it's uniqueness. "Think fielding grounders is hard? Now try fielding grounders while on a donkey," said Matt Monagan at the Cut 4 blog. 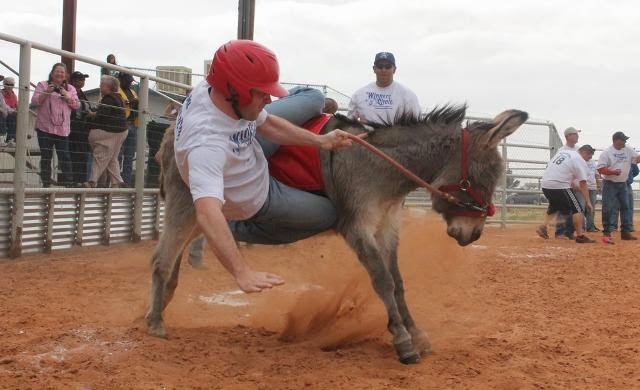 And that appeared under a classic headline, "There are people playing baseball while riding donkeys in New Mexico." Way to make headlines Optimists! We love your spirit at the Alamogordo Optimist Club. 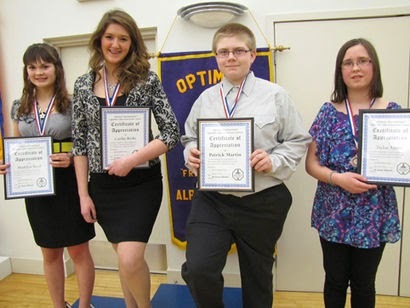 It is scholarship season for Optimist Clubs. The Optimist International Essay Contest has just ended and now the focus turns to public speaking as students are asked to complete a five-minute speech on "How my passions impact the world" for the Optimist International Oratorical Contest and Communications Contest for the Deaf and Hard of Hearing (CCDHH). In Danville, Virginia, Optimist Club president Ken Boyer went to the local paper promote the club level contest. He said, “As they prepare for their future, many of our local students need experience expressing their thoughts and opinions to an audience. 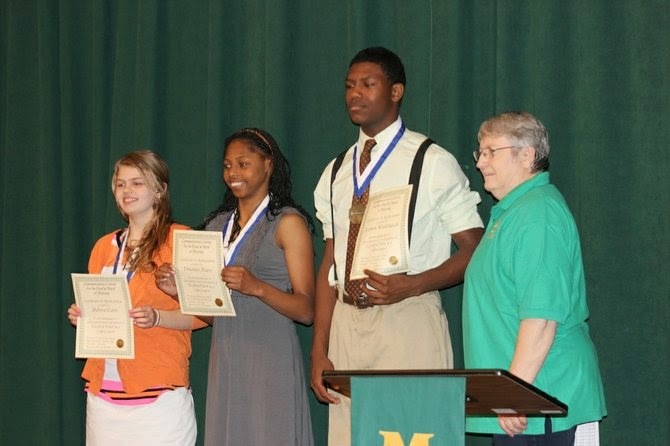 The oratorical contest challenges them to do just that and also offers an opportunity for scholarships. In this way, our club hopes to bring out the best in each of them and help them achieve their goals for the future." Indeed, communication has never before had center stage as it does today. With social media, we put our thoughts out for others to see daily via blogs and microblogs like Facebook, Twitter, and others. It is critical that our young people learn and practice formal research, writing and speech to complement their informal prowess. All Optimist International scholarship contests begin at the club level. Winners advance from the club to zone, regional and district finals where they are ultimately awarded a $2,500 scholarship. One of the most exciting things about the program is there is no minimum age. Students can start competing as early as they want up until 19 years. Over the years, past participants have said that the process of preparing and presenting at each level and meeting new friends and audiences was as much fun as winning. Of course all could use an extra $2,500 for college, but it's rewarding to know that the experience is valuable. Click to find out more about the Optimist International scholarship programs. Click to find an Optimist Club near you. Click to see photos of Optimist Club scholarship winners and program participants.